NYC is Blue: Happy belated Andrea Pirlo Day, everyone! Happy belated Andrea Pirlo Day, everyone! 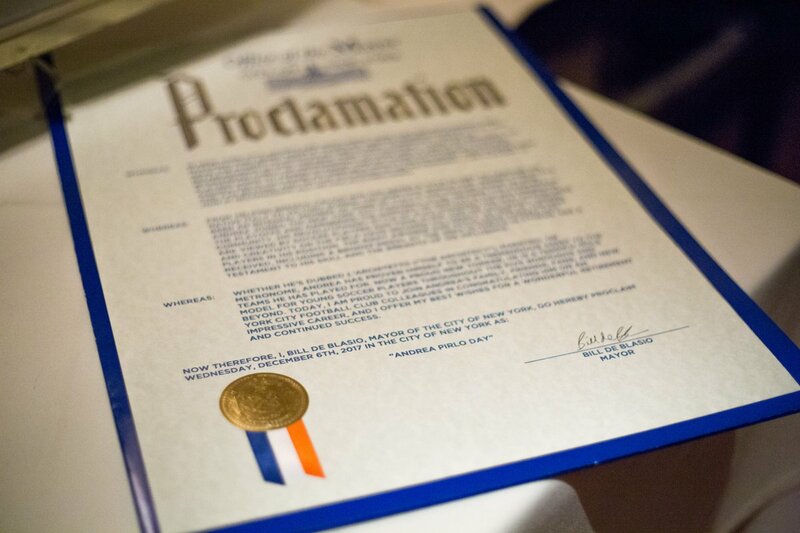 Mayor De Blasio proclaimed yesterday as Andrea Pirlo Day in honor of the Maestro's retirement. And we missed it! WHEREAS: IN NEW YORK CITY, SPORTS ARE MUCH MORE THAN JUST ENTERTAINMENT AND PASTIMES; THEY BRING PEOPLE TOGETHER, INSPIRE GENERATIONS OF FANS, AND HAVE THE POWER TO UNITE US AS ONE GLOBAL COMMUNITY. 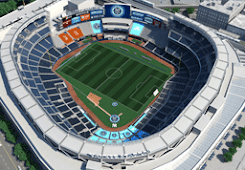 SINCE ITS ESTABLISHMENT IN 2015, THE NEW YORK CITY FOOTBALL CLUB HAS BROUGHT THE WIDESPREAD THRILL OF PROFESSIONAL SOCCER AND A LINEUP OF TALENTED PLAYERS HOME TO YANKEE STADIUM. ONE OF THESE OUTSTANDING ATHLETES, ANDREA PIRLO, HAS MADE AN INCREDIBLE IMPACT ON THE SPORT HERE IN NEW YORK AND FAR BEYOND, AND ON THE OCCASION OF HIS RETIREMENT, I AM PLEASED TO JOIN IN RECOGNIZING ALL HE HAS ACCOMPLISHED. WHEREAS: FROM HELPING BRESCIA CALCIO WIN THE SERIE B TITLE IN 1997 TO LEADING HIS NATIVE ITALY TO VICTORY DURING THE 2006 FIFA WORLD CUP, ANDREA PIRLO HAS BEEN AN INTEGRAL MEMBER OF SOME OF ITALY'S TOP SOCCER TEAMS. IN 2015, ANDREA JOINED THE NEW YORK CITY FOOTBALL CLUB, HELPING THE TEAM REACH THE PLAYOFFS AND GARNERING THE SUPPORT OF OUR CITY'S ITALIAN-AMERICAN COMMUNITY. HIS REVOLUTIONARY STYLE OF PLAY CHANGED THE WAY MIDFIELDERS ARE VIEWED BY SOCCER PLAYERS AND FANS ALIKE, AND HIS ACCURACY, VISION, AND CREATIVITY ON THE FIELD HAVE SECURED HIS LEGACY AS ONE OF THE BEST PLAYERS IN HIS POSITION. THE MANY AWARDS AND ACCOLADES ANDREA HAS RECEIVED, INCLUDING A BRONZE MEDAL AT THE 2004 OLYMPICS IN ATHENS, ARE A TESTAMENT TO HIS SKILL AND THE BREADTH OF HIS INFLUENCE. WHEREAS: WHETHER HE'S DUBBED L'ARCHITETTO ("THE ARCHITECT"), MAESTRO, OR METRONOME, ANDREA HAS PROVEN HIMSELF TO BE A TREMENDOUS ASSET TO THE TEAMS HE HAS PLAYED FOR. NOW A PROUD NEW YORKER, HE IS A TERRIFIC ROLE MODEL FOR YOUNG SOCCER PLAYERS THROUGHOUT THE FIVE BOROUGHS AND BEYOND. TODAY, I AM PROUD TO JOIN ANDREA'S FAMILY, FRIENDS, FANS, AND NEW YORK CITY FOOTBALL CLUB COLLEAGUES IN CONGRATULATING HIM ON AN IMPRESSIVE CAREER, AND I OFFER MY BEST WISHES FOR A WONDERFUL RETIREMENT AND CONTINUED SUCCESS. Couldn't happen to a more deserving guy. Congratulations to the Maestro!